“We are Centennial College ECE students. We are advocating for Newcomers to Canada. Through a public conversation, the City of Toronto in Ontario, Canada, wants to identify what’s working, what needs to change and what are the best ways to address barriers to City services for newcomers. The City also wants to identify next steps in facilitating civic participation of newcomers. 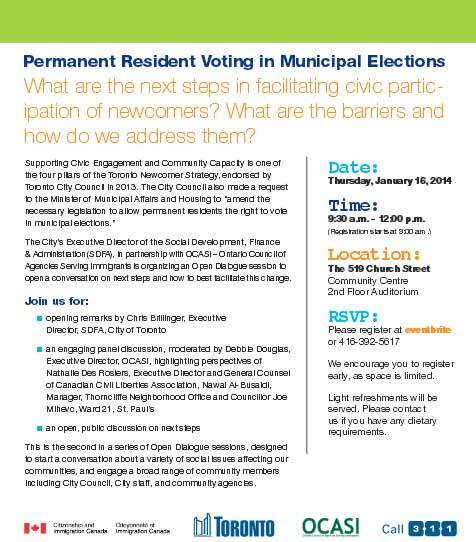 FREE, Open Dialogue session: Permanent Resident Voting in Municipal Elections; 9:30 a.m. to noon. RSVP: Please register at eventbrite or 416-392-5617. They encourage you to register early, as space is limited. Please contact them if you have any dietary requirements. Supporting Civic Engagement and Community Capacity is one of the four pillars of the Toronto Newcomer Strategy, endorsed by Toronto City Council in 2013. The City’s Executive Director of the Social Development, Finance & Administration (SDFA), in partnership with OCASI – Ontario Council of Agencies Serving Immigrants, is organizing an Open Dialogue session to open a conversation on next steps and how to best facilitate this change. an open, public discussion on newcomer access to City services. FREE, Open Dialogue session: Newcomer Access to City Services; 1:30 to 4 p.m. Registration starts at 1:00 p.m. 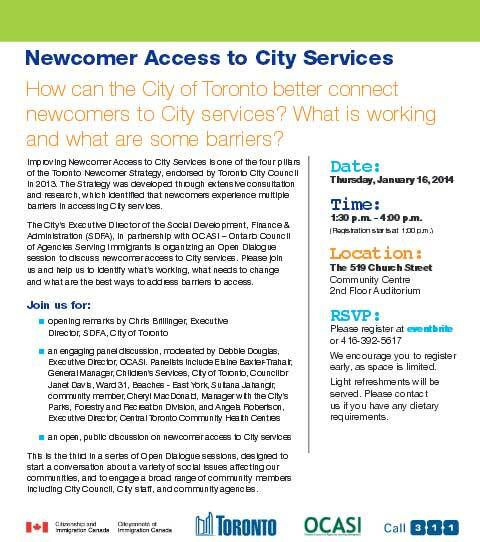 Improving Newcomer Access to City Services is one of the four pillars of the Toronto Newcomer Strategy, endorsed by Toronto City Council in 2013. The Strategy was developed through extensive consultation and research, which identified that newcomers experience multiple barriers in accessing City services. The City’s Executive Director of the Social Development, Finance & Administration (SDFA), in partnership with OCASI – Ontario Council of Agencies Serving Immigrants is organizing an Open Dialogue session to discuss newcomer access to City services. Please join them and help them to identify what’s working, what needs to change and what are the best ways to address barriers to access. The City of Toronto, in partnership with Ontario Coalition of Agencies Serving Immigrants (OCASI), will be hosting two Open Dialogue sessions designed to start a conversation about a variety of social issues affecting our communities, and to engage a broad range of community members, including Councillors, staff and community agencies. Through a public conversation, the City wants to identify what’s working, what needs to change and what are the best ways to address barriers to City services for newcomers. The City also wants to identify next steps in facilitating civic participation of newcomers. Improving access to City services for new immigrants and supporting their civic engagement are two of the pillars of the Toronto Newcomer Strategy, endorsed by Toronto City Council in 2013. The Strategy was developed through extensive consultation and research, which identified that newcomers experience multiple barriers in accessing City services. To learn more or to register for a session, visit: http://www.toronto.ca/opendialogue or call 311.